Lipedema is a painful condition often confused with obesity. Do you have it? 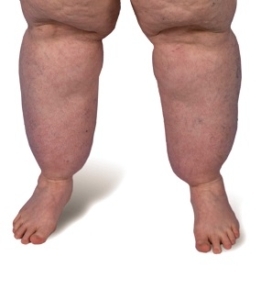 With Lipedema, the lower body is much larger than the upper body. The lower half often requires a much larger clothing size. Lipedemic tissue is doughy and has indentations like cellulite. Often grainy nodules can be felt below the skin. For many with Lipedema, extra tissue collects around the ankles while feet remain unaffected. Lipedema causes fat tissue to deposit around the knees and inner thighs. In the later stages of Lipedema, fat collects on the upper arms. If you have one or more of the above symptoms you may have Lipedema. Find out more or schedule your Lipedema appointment now. Have You Had Liposuction to Treat Lipedema or Dercum’s Disease? Participate in Our Liposuction Research Study! Removal of abnormal fat tissue from people with Lipedema or Dercum’s Disease by Lymphatic Sparing Liposuction is a common treatment in Europe and now in the United States. If you are 18 years of age or older with Lipedema or Dercum’s Disease and have undergone liposuction to remove abnormal fat tissue in the United States. The University of Arizona is conducting a research study to better understand the benefits and the drawbacks, if any, of liposuction performed in the United States. We are asking that you participate in our study by completing our online questionnaire. Before the questionnaire begins, you must give your consent to participate in the study. The study consists of answering 83 questions and should take no more than one hour to complete. Thank you for your participation. Questions or Comments for Dr. Byrd? 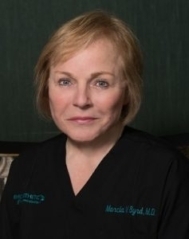 As the Medical Director and founder of the Lipedema Liposuction Surgery Center, Marcia V. Byrd M.D. has over twenty years of experience in liposuction and body-sculpting techniques including lymph-sparing WAL (Water-Assisted Liposuction) and PAL (Power-Assisted Liposuction) techniques. Dr. Byrd has performed over 1,000 Lipedema liposuction surgeries and has trained with Dr. Josef Stutz of Germany, the world renown authority on Lipedema liposuction. Located in the quiet Atlanta suburb of Roswell, Georgia, the center is designed and staffed around the expert care and treatment of Lipedema patients. The staff is happy to assist patients with travel accommodations. the rest of my surgeries instead of having them in NYC. Getting Lipedema surgery was the best thing I have ever done for myself. I can walk a mile now without any pain. I chose Dr. Byrd as my Lipedema surgeon after consulting with two other top Lipedema surgeons – and I couldn’t be happier with my decision. I wanted a surgeon that had studied with Dr. Stutz, used the latest lymph-sparing techniques and had years of experience with cosmetic liposuction. Dr. Byrd had all of these qualifications, but what really set her apart is her sincere compassion for treating women suffering from Lipedema. My surgeries went well and I am very pleased with the results. I would like to thank Dr. Byrd and her wonderful staff for all the help during my Lipedema surgeries.